Check out CoachDaveLive.com/events for upcoming conferences, huddles and more. Get involved, today. Todd Barham is suffering with leukemia in a Texas hospital. His faith is inspiring. He sees this whole ordeal as a process of becoming refined in Christ. He says the worst is yet to come, but it’s all good, because he has peace, and is growing in the Lord. When we are exhausted, we are tempted to grow weary, but the Bible says not to grow weary in well doing. Bobby Lee takes on libs who want to impeach Trump by simply asking what exactly Trump has done that they don’t like. They didn’t have good answers. The number 1 killer of people in the United States each year is abortion. 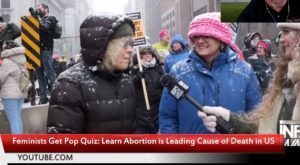 Info Wars went to the DC pro-abortion women’s march on Saturday, January 19, 2019 and asked women if they knew what the number 1 killer of Americans is. One woman said it was violence against women… Abortion IS violence against women. One of the most damning statements in the Roe v. Wade document is that if it can be proven that babies are truly babies in the womb, the ruling is mute. Now, we know a baby’s heartbeat begins at 6 weeks. If a person’s death happens when the heartbeat stops, then the heartbeat going must mean there is life. Ben Shapiro defended life with a leftist at the DC March for Life rally on Friday, January 18, 2019.Bill Nye denies the moral truth that all life in the womb is sacred and deserves to live, though he cannot deny the scientific truth that life exists in the womb from conception to birth, until natural death. Josiah Thomas (brother of Jeremiah Thomas, who died last year) expounds on life and the gospel, on the streets. How many young people today, in evangelical churches, could do that?